We hope you all had a good Labor Day. Steven spent his at SPOGA in Cologne, Germany. SPOGA is the largest barbecue and outdoor living trade show in Europe. Here’s Steven with the new European distributors of the Best of Barbecue line: Martin Erikson (left) and Dennis Kristensen (right) of Fjelsted-Lange of Denmark. 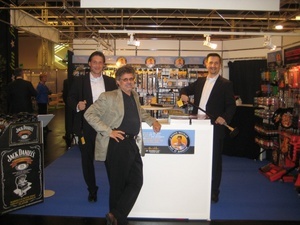 For information on where to find Steven’s products in Europe, please visit the web site: www.fjelsted-lange.com. While at SPOGA, Steven connected with Marco Greulich–German barbecuer extraordinaire (his team just won the World Barbecue Association Championship in Belgium). 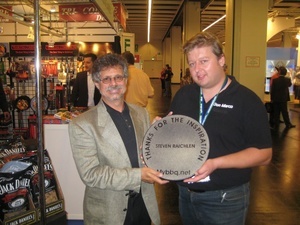 Marco has been an invaluable resource for Steven’s Planet Barbecue research and he presented Steven with this very nifty plaque, which doubles as a pizza stone. Thanks, Marco, and congratulations!